Medium: Fischer's medium with 10% heat-inactivated horse serum (in cell bank). RPMI 1640 medium with 10% fetal bovine serum is used for mouse lymphoma assay for mutagen. RPMI 1640 must contain L-glutamine (such as GIBCO Cat. # 11875-093). 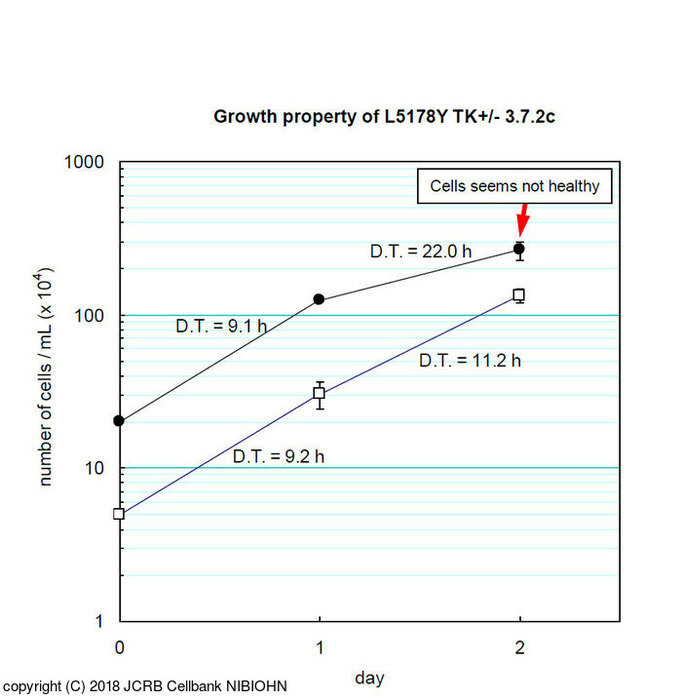 The L5178Y TK +/- is suspension culture (not adherent cells). The passage method is simple dilution. The cells tends to form small cell aggregates. The growth of this cell line is very fast. The population doubling time will be <10-12 hrs. If passage interval is every 2 days, the suitable initial seeding densitiy will be 2 - 3 × 10^4 cells/ml. If the density becomes too high, the condition of cells becomes wrong. It is important to maintain the cells below 10^6 cells/mL. Mouse TK+/- heterozygotic subline of the L5178Y. No regulation was applied to this strain to establisher. Fischer's medium with 10% horse serum. The L5178Y tk+/- 3.7.2c (IVGT) mouse lymphoma cell line was derived from a thymic tumour induced in a DBA/2 mouse by methylcholanthrene treatment. The cell line is tumourigenic in DBA/2 mice. The cell line can be used in genotoxicity tests including gene mutation assays at the tk and other loci and micronucleus induction.